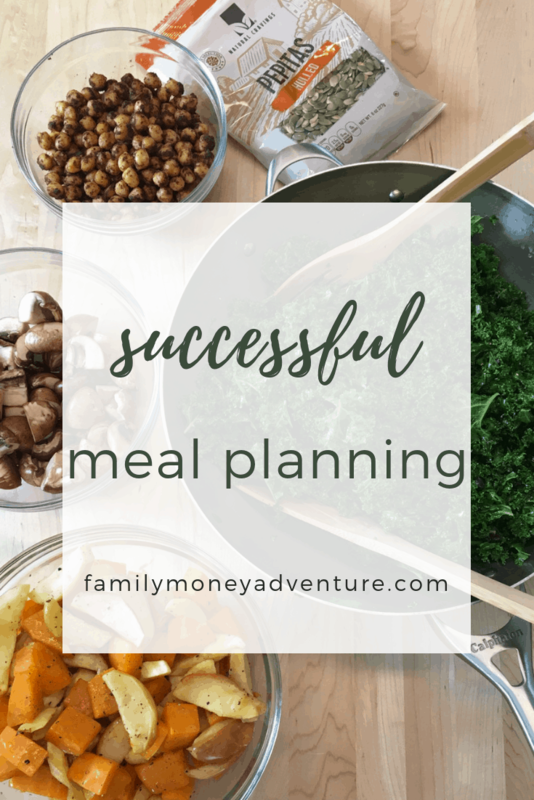 Today marks the beginning of a special series of posts on meal planning. My special guest for the series is Meg from Gingy Love. 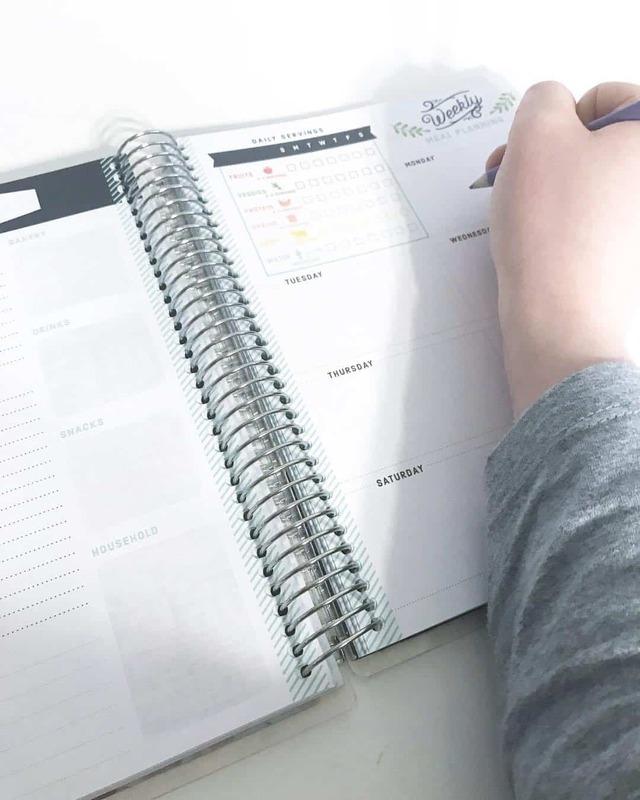 Meg is going to teach us how to meal plan and how meal planning can save money (and time) for your family. I’m excited to learn so let’s get into this! Something I finally gave into this year that has helped me immensely is getting rid of the idea that it has to be different every week. We have Taco Tuesday and Spaghetti Wednesday and some nights we even have sandwiches. I don’t need to make a Pinterest style meal every night of the week. If you do it will burn you out. Since I know those will be reoccurring meals I can buy and prepare accordingly. Like tacos, one week I will make them fresh using upwards of 5 lbs. of beef (for three of us but if you can make more) and freeze the rest in quart sized bags. The next time we want tacos they’re easy to grab and take half the time. Like mentioned before if I have time to cook I will cook way more than we need for that night. I also buy my freezer ingredients in bulk so I make 4-5 meals at once and throw them in the freezer. This helps me reduce waste and cuts on prep time during the week. If I spot a good deal on the chicken I will buy 2 or 3 packages and portion them out when I get home. This really is the only way I can achieve success in meal planning. When I have the energy to meal plan I go hard and it pays off. I would rather get 4 or 5 of the same meal prepped in my freezer than have 12 different meals that I have to cook fresh. Trust me those days you don’t want to cook and just get nuggets you will be proud of yourself for putting in that effort. Your body will thank you too. Something I think that has been lost in my generation is the joy of making your own food. If you love pizza rolls, make your own. Everything you buy that is pre-packed and processed is more than likely super easy to make at home. You’re paying for the convince but really it’s fun to make your own. Lately, I have been making my own smoothie packets and bread. My husband cannot get enough of the bread I make and prefers that over what we buy. Cooking is relaxing and fun so use it as a way to destress after a long day, not a chore you have to do. This past summer I didn’t have to buy marinara sauce at all. It’s not a huge saving compared to the cost of a jar, but for my family, it really helped. We have spaghetti at least once a week plus we make our own pizza. Some weeks we even have spaghetti twice because it’s easy and Tinley loves it. If you have a meal that you are eating over and over or an ingredient try your hand at growing it. Last year in our family garden we tried growing spinach since we use it on and in a lot! Having a consistent meal plan helps because you know what produce you use over and over so then instead of buying it every week you can have it fresh in your backyard. At the end of the season just freeze what you don’t use! 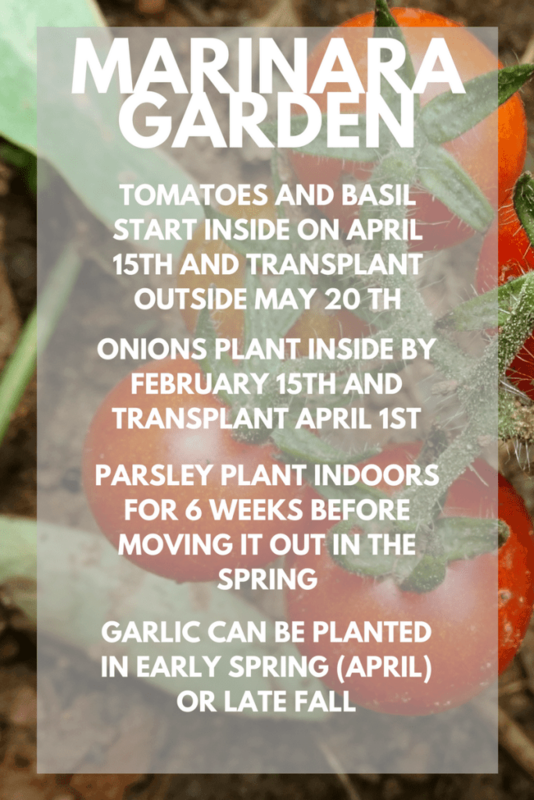 I created a little graphic so you know when to plant your own marinara garden! Seriously I cannot stress this enough, freeze as many meals as you can at once. This will truly set you up for success. Not to mention if you are wanting to save money one week you can just pull from the freezer. Really after Christmas is always a hard time but we didn’t feel the crunch because I didn’t have to go to the store all too much. Our last shopping trip included sour cream, creamer and tortilla chips. We already had all the ingredients for burritos and a taco pizza in the freezer. Your freezer is your best friend! I wrote a post a while back about freezer friendly meals if you want to check it out! There will be nights that you don’t want to cook. That’s the joy of meal planning so you don’t have to worry about making something from scratch. But what if you don’t feel like having what is in the freezer? Well then while you’re out shopping pick up a “cheat meal” we usually go for a pizza or chicken fingers. It’s easy and we can throw it in the oven and forget it for 15 minutes. This dinner may not be a notorious or spectacular choice but it is cheaper than running through fast food. Our back up has actually been roasted potatoes and chicken breasts. I season them all on the same baking sheet and throw them in the oven for 30 minutes. It takes me less than 3 minutes to prepare and while it’s cooking I relax with my family. Whew, well I hope that helped with your meal planning search. If you want me to do an updated meal prep guide let me know. If you want a personalized meal plan for the month then I am now offering this service just email me at meggingylove@gmail.com! My name is Meg and I write about all of the loves in my life. I take way too many pictures of my daughter, buy way too many bows and I eat more avocados than the average person. Enjoy my ride! Have any meal planning questions for Meg? Let us know in the comments below!